If you have been researching what ERP system to purchase to replace your current system, have you asked the vendor what development platform they use? This is a critical component to any ERP system and you could easily find yourself in a situation in which the ERP system you install today is already a technological dinosaur. Buying an ERP system written in a language which either has gone completely out of existence or is no longer being invested in by its developer is an extremely risky proposition. Before buying an ERP system, ask the vendor to supply you with the name of the company that created the development environment the application is written in, along with some supporting documentation that the environment will stand the test of time. Upgrading to a new ERP system can be a daunting task with many suppliers and platforms available. Weeding through the sales pitch and doing your due diligence is absolutely critical because the financial investment can be steep. It’s important to look beyond the touted business features to gain a solid understanding of the product’s structure of the product. Does the new ERP system have the capability to support your company’s growth and changes over an extended period of time? Can it scale in proportion to changes in your business? Will the technology be commercially available and applicable beyond the short term? You need not be an ERP technical expert; however, asking pertinent questions can make the difference in having your new ERP system supported by a ‘state of the art’ foundation or selecting an antiquated development base and ultimately fail you in the long run. Commercially available development language which is available for purchase separate from the ERP application. It also means that the availability of individuals experienced in the language is relatively limited. This, in turn, means the vendors cost associated with using one of the few individuals around who is experienced in the proprietary language will typically be 2-5 times greater than the cost of an individual experienced in a commercially available language. The results will be that your support costs could easily increase substantially over time. Since the development language is tied directly to the software package itself, it is highly likely that attempting to integrate third party business components you need to run your business will be unable to function properly or not able to be integrated at all. If your ERP vendor is using LAMP technology then there is no risk; your new ERP system will be solid and applicable for years to come. For the entire life of the web, the backbone that’s kept it upright are the tools of Linux. Linux, Apache, MySQL, PHP, Perl, and Python — collectively known as LAMP. 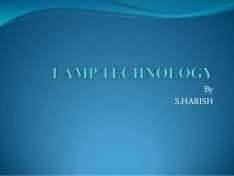 LAMP technology comprises more than two-thirds of the servers, databases, and scripting languages on the web today. Open source products are free for download which makes the software itself less expensive. LAMP is also extremely stable and scalable. As new versions of the individual components are released the backward compatibility is typically very good. Finding skilled developers for LAMP can be both harder and easier. The free and prevalent nature of LAMP lowers the barriers to entry for new developers which means that there are many more LAMP developers than other platforms. The need for rapid prototyping makes LAMP particularly attractive. The LAMP stack is an excellent platform for rapidly building and prototyping applications. The ability to quickly build working applications that will run on low cost hardware is one of LAMP’s biggest strengths.